Standard honeycomb breadboards have ferromagnetic steel skins which are 3mm thick and are sold with core thickness of 50 or100 mm. The ferromagnetic steel skins are coated with a black anti-reflective polyurethane impervious to most chemicals. The coating absorbs more than 90% of light incident upon it and more than 95% of the energy in near perpendicular incidence and scatters grazing reflections to less than 5%. The core of these breadboards is a high density honeycomb made of composite materials that eliminates resonances. The core is vertically bonded, waterproof and acid resistant. 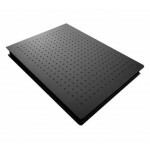 Further, the honeycomb weight is significantly less than steel core used by other manufactures making our honeycomb breadboards lighter while still maintaining high rigidity and vibration dampening. Our breadboards are designed by optical researchers with experience in both academic and industrial laboratories. The design stresses functionality and performance at the best cost to the customer. Advanced materials and designs are used to provide increased vibration damping and decreased weights when compared to conventional breadboards and tables. The skins, core and final coating are manufactured separately and then assembled into the final unit.